Thanks to everyone who took advantage of the hosting and theme deals that ran from Black Friday to Cyber Monday. Those are over, but you can still get in on big savings for BlogAid classes and services including the expanded DIY SEO course that now includes the live SEO Workshops, savings on a site audit, and a huge discount on the Webmaster Training courses. I’m delighted to announce that I’ve posted the session outline for the SEO Workshop. There will be at least 8 sessions and we’ll expand those if we need to. Plus, we’ll be taking more time for each session and they will run 2-3 weeks apart instead of just one week in between. That’s the whole reason I combined the Workshops into the DIY SEO course. We need to be able to take more time for each topic and go deeper. So, even if you attended the one back in March, you’ll definitely want to come again this time around. You’ll find the outline below the specials page, or in your member dashboard. And, I’m delighted to announce the creation of a new Facebook group for DIY SEO members. It’s already open and folks are joining in with us. If you’re a member of the DIY SEO course, look for an email I sent you on Sunday with the link to the Facebook group. You’ll also find it at the top of your member dashboard area in the courses. I want to send a huge thank you and shout out to Jeanne Biggerstaff of Biggerstaff Virtual Business Assistance for all the new BlogAid email templates she created for me. I wanted to radically clean up and simplify them so they would sail through all email clients and she made super quick work of the new templates. They are exactly what I was hoping for. So, BlogAid News subscribers, and everyone in all the different memberships, be watching for the new, shiny templates to start coming your way. Now, the only template we left the same was for the RSS to email feed that sends you my blog posts. It’s already pretty slick. And just for clarification, when you subscribed to BlogAid News, which is the newsletter I send when there is important news or special discounts, you probably left the box checked to also get all of my blog posts. Tips Tuesday is one of those posts. It’s also a podcast. It’s weekly site success news and tips you can use. But it’s not a weekly newsletter. I don’t share BlogAid News publicly because it has exclusive deals for subscribers and secret scoops on what’s happening. And I’ve had folks contact me that they want to read the blog feed in a feed reader, so they unsubscribe from just the posts. There are two checkboxes for that. One for BlogAid News, and one for the posts. So, be careful which one you check. You don’t want to miss all those BlogAid News special deals!! I want to send a shout out to visibility expert, Denise Wakeman, and thank her for a super 5 day challenge last week. Y’all may have seen new, quick videos and posts on my social media accounts with an odd little hashtag. Those were for that challenge. Denise helped us get started with repurposing our content in 5 different ways. One of those was Medium. I grabbed up the BlogAid name there years ago, just to sequester it. I was stunned to find that I had 1,000 followers even though I had never posted a thing there. I’ve heard that Medium’s popularity has waned a bit this year. But, it is so crazy easy to repurpose content there that I think I’ll get the good out of having so many eyeballs receiving notifications there when I make a new post. Hey, more eyeballs is what it’s all about, right? Now, that little free challenge is over, but Denise has a 7 day challenge that is always open. I never miss one of her free challenges!! So, go check it out and you’ll see why. Gutenberg is all the buzz this week. And I have lots of posts for you on the conversations happening since WordCampUS. 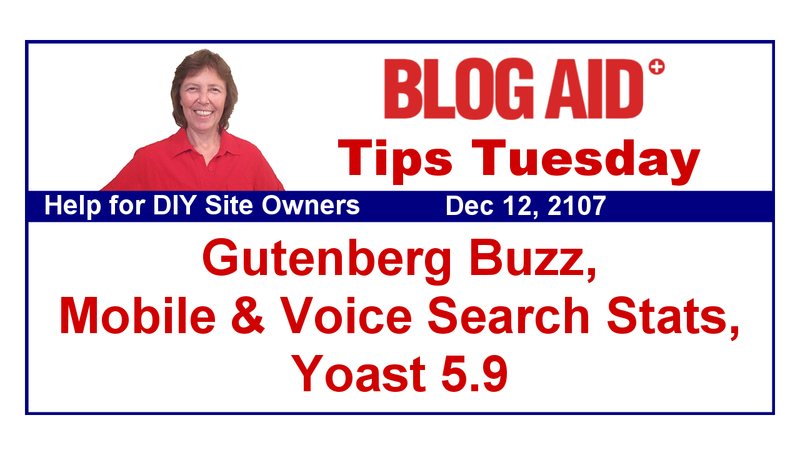 You may recall in my special edition of Tips Tuesday last week, with a wrap up of my WordCampUS Adventure that I mentioned Morten’s presentation on Friday that helped open everyone’s eyes about just how powerful Gutenberg really is. Well, he’s posted over on LinkedIn with the slides from his presentation and the video of the presentation so you can get a glimpse at it yourself. Then, jump on over to Matt’s State of The Word address for a live demo of Gutenberg. And obviously I wasn’t the only one super excited about Gutenberg after WordCampUS. Josh Pollock of Caldera Forms came back from Nashville all excited about it too. He has a very nice write up about why he’s all aboard the Gutenberg train. There are multiple discussions going on in all of the advanced WordPress and dev boards I follow concerning how we are going to make the transition to Gutenberg as painless and fast as possible. One such is on Github and it focuses squarely on the plugins. Honestly, I think this type of project is long, long overdue and I’m glad transitions into things like PHP7 and Gutenberg are making it happen. Bridget Willard has a nice op-ed post with her concerns about how Gutenberg’s rollout may economically impact theme and plugin devs, as well as end users, including corporate users. I think this post really sums up the buzz among most devs. They want a slower pace where users are concerned. They don’t want Gutenberg to be the default anything right away, and to give time for devs to learn Gutenberg and make necessary changes. They also want time to educate users and do lots of testing before putting Gutenberg on a live, production site. But, as Bridget states in her article, we can’t hold the transition time open indefinitely. Devs and site caretakers won’t be able to keep everything backwards compatible for more than a year or two. While we don’t wish broken sites on anyone, we do want more site owners to get with today’s standards and be ready for what’s next. As a BlogAid follower, you’ve had the opportunity to stay ahead of the curve on all site ownership changes this past year. And you know I’m going to help you bypass all of the Gutenberg and WordPress transition hoohaa too. Right now, it looks like when Gutenberg rolls into the core in the 5.0 update, we are going to switch to the Classic Editor plugin and keep going just as we are now. Or, maybe that plugin will be rolled into the core and we’ll have an option to use it. We’re going to be patient. We won’t try to use Gutenberg on our current themes with our current plugins. Then by this time next year we’ll be getting peeks at viable Gutenberg optimized themes and plugins. And by early 2019 some of us may be ready for a theme revamp and to try one of those themes. But the rest of us will continue to use what we’ve got and/or not wait on those changes to do the theme revamp we need now. I’m certainly not going to wait for Gutenberg. I’ll be starting on the redesign of BlogAid in just a few months. My biz focus and offers have changed and I need a theme that looks more modern and helps me with my conversion points better. And I need that now. So, I’m putting my money where my mouth and my advice to you is and doing what I need to do for my biz today. If you need to start a new site now, or revamp your current theme, don’t wait. There are millions of site owners that have no clue about PHP7, HTTPS, or Gutenberg. The next year of transition is going to take a whale of a lot of public education. That’s especially true for the more non-geek, hands off site owners who are paying either premium hosts, or under-educated VAs to look after their sites. a plugin update breaks their site because their PHP version is too low. they get an Unsecure Site warning when Chrome finally rolls out that penalty to everyone that’s non HTTPS. when their text editor is suddenly replaced by Gutenberg and they have zero idea how to even create a blog post anymore. So, I’m asking you to do what you can to help spread the word and get as many folks through this transition as smoothly as possible. You may remember in the last Tips Tuesday’s that I reported about a new project called Tide that will evaluate the quality of a plugin’s code. Well, seems like even more handy tools are coming to the plugins repo. Plugins now state how many times they have been downloaded. And that’s a nice thing to know. But, it looks like they are now including info to show how many active installs a plugin currently has and then a graph you can see in the Advanced view to see its downloads per day, plus its active growth. I believe they are going to count that be how many sites update to newer versions when they are released, but don’t quote me on that, because all of this is still in the development stage and kind of new. What’s really great about this type of info is we can see if a plugin is still popular or not. It may have had 100s of 1000s of downloads in its lifetime, but if it starts waning in popularity, the number of active installs will start going down. If you want to see those graphs, go to the plugin’s repo page. Then in the right sidebar, under the Version and Last Update type info, you’ll see an Advanced View link. Click that to see the new Plugin Stat graphs. When I checked Sunday night, they had 1.3 million downloads just last week!! Geez!! You go Yoast!! The latest release of Yoast SEO introduces the ‘wpseo_add_opengraph_additional_images’ filter to allow additional OpenGraph Images to be added at a low priority. I thought this may be a hidden image Pinterest thing, but it’s not. Also in this release, your color coded content analysis is all grouped by color now instead of topic, with red at the top, making any issues with the post easier for you to find. SEO is not a set it and forget it thing. If you want to get an idea of just how many changes Google makes a month, go scan this monthly report over on SEO Roundtable. 150 tweaks a month is not unusual. Well, it’s official now. You may recall me reporting on this upcoming acquisition about a month ago. And it concerns me a little. We now have a company that helps you spread the word on social media combined with a company that tracks your visitor’s movements around the web. Sprout Social is a pretty good company and I hope this doesn’t come back to bite them. Maybe it will have the opposite effect and bring them more clients due to better analytics. Moz SEO invited its readers to take a survey that started with identifying their SEO role with their company, and what their biggest struggles were. I wasn’t shocked to see the top struggle. The very marketing folks charged with getting a site to rank well in Google and bring more traffic to the site have a super hard time getting their clients / colleagues / bosses to understand the value of SEO. Their other big complaint was that the industry tactics change too often. That is why it’s super duper important for you to go for the long game strategies with SEO instead of trying to game the system for each new thing that comes out. The biggest long-term strategy you can do is to write truly helpful content that folks need to read and want to share. And that’s just one of the things we’ll be covering in the SEO Workshops. All the keyword research in the world is not going to help you if you have thin content that’s no better than anyone else’s in your niche. There are several rising SEO ranking factors that we’ll be covering in the SEO Workshop. Among them are the rise of mobile search, where viewers are only shown results from mobile optimized sites. Another is voice activated search. Now, that’s a big one. And we’ll be brainstorming ways for you to write the kind of content that works well with voice activated search. So, if you are a foodie blogger, you may not think you have much of a shot at this because your posts are all pictures and ingredients and folks really do need to see the post, not hear it. But, there are plenty of opportunities for you with voice activated search that you probably haven’t thought of. And, that will open the door for you to have a shot at getting into the Google Knowledge Graph too. The point is, if you want something you’ve never had, you’re going to have to do something you’ve never done before. And that includes writing some posts specifically for Google. My first post to hit the Knowledge Graph has remained in my top 3 posts for 3 years now, and still counting. And I have other posts that bring in 75% of my new visitors from Google. That’s what it’s all about, getting those new eyeballs.